Q. The overdue/reminder/check-out summary e-mail sent out by the library has unreadable characters. What can I do? From "Move" column, click "Actions" tab. An "Actions" daughter window pops up. Hover on "Other Actions". An "Other Actions" daughter window pops up. Hover on "Encoding". 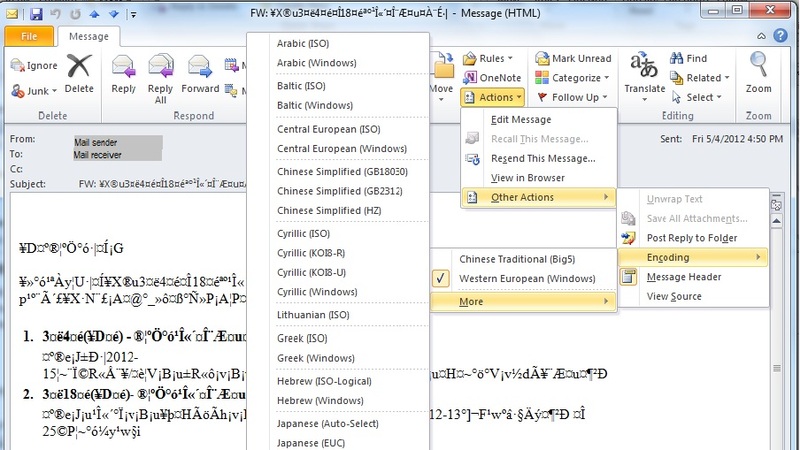 Click on the appropriated encoding such as "Chinese Traditional (Big 5)". If you cannot find your desired encoding, click "More" first, and choose from the "More" selections.